The nearby Cité des Sciences et de l'Industrie, located in the Parc de la Villette, is the biggest science museum in Europe. The glass and steel building was designed by Peter Rice and it was opened in 1986. An interchange with Paris tramway Line 3b opened on 15 December 2012. The station is featured in Battlefield 3, in which it is featured in a multiplayer map. 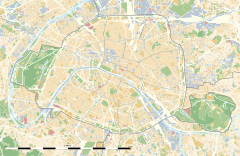 Wikimedia Commons has media related to Porte de la Villette (Paris Metro).